Contrary to popular belief, this isn't actually a one hit wonder. 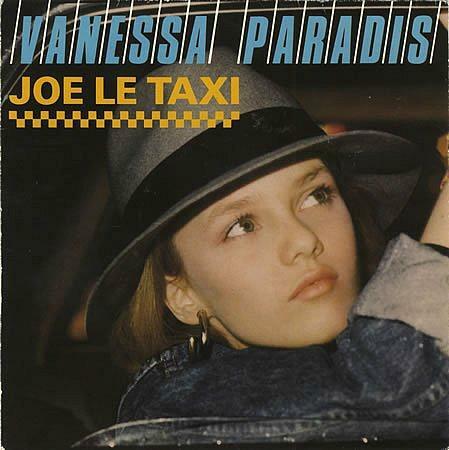 Vanessa Paradis actually had another UK hit in 1992 with Be My Baby which reached No.6, but Joe Le Taxi was her only 80's hit in Britain. It was a No.1 hit for eleven weeks in her home country of France, and it was released in the UK on 25th January 1988 and peaked at No.3 in the singles chart. The lyrics to Joe le taxi are about a taxi driver, Joe, who works in Paris - pretty obvious really, so why didn't I realise this back in the 80s? Come to think of it, I didn't really start taking too much notice of lyrics until I was out of my teens, whether they were in French or English! Anyway, Joe is very knowledgeable about the French capital (that's Paris, of course you knew that) including the locations of all the little bars, Parisian streets, the river Seine and its romantic bridges. The song's lyrics also suggest that Joe enjoys drinking rum, has a passion for Latin music and his saxophone and dreams of going to the Amazon. Spanish-Cuban bandleader Xavier Cugat and Peruvian exotica singer Yma Súmac are also referred to in the lyrics. Vanessa Paradis dated American singer Lenny Kravitz between 1992 to 1996, and has been in a relationship with Johnny Depp since 1998.